It was at the surprising age of eight when musicians Will and Peter Anderson fell in love with jazz music. The unlikely culprit of this adoration? A Chips Ahoy! TV commercial, which featured Benny Goodman’s “Sing, Sing, Sing” in the background. “That inspired us to pick up the clarinet,” says Will, with a chuckle. The two began formal lessons the following year, when they joined their school’s band program. 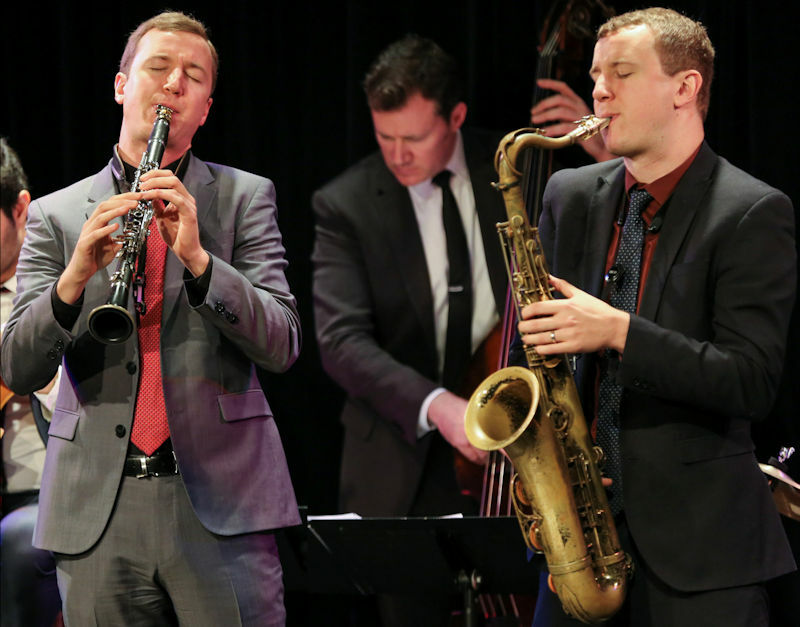 And while their studies focused more on classical training—including a six-year stint at The Juilliard School in New York—jazz was always their passion. On Saturday, December 1st, the identical twins will perform a throwback to that serendipitous introduction to jazz when they take the stage at Oxford Community Center. Chesapeake Music and OCC have joined together in a harmonious partnership to present Benny meets Artie with Strings. The show will celebrate the music of legendary big band leaders, Goodman and his widely perceived competitor, Artie Shaw. The acclaimed clarinet prodigies were renowned for pushing the boundaries of jazz, encompassing elements of other genres while maintaining impeccable technique. 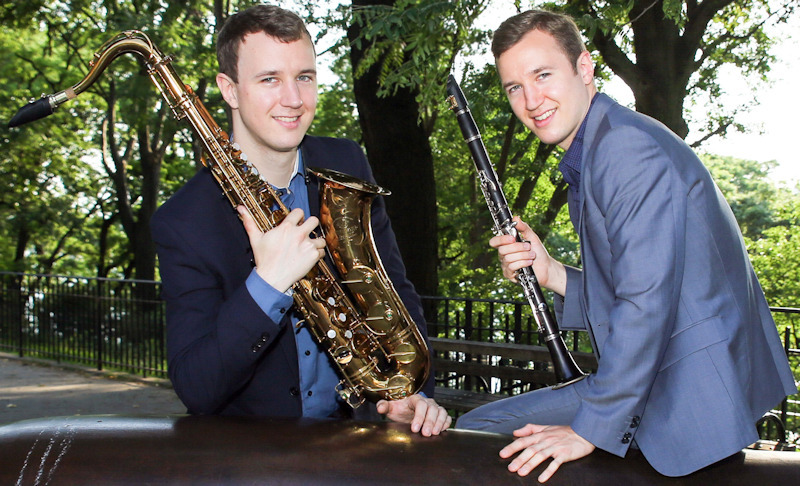 A feat it seems the Andersons, who the New York Times calls “virtuosos on clarinet and saxophone,” are on track to obtain—albeit without any rivalry! The Andersons, playing reeds, will be joined on stage by 15 string players, along with a pianist, bassist, and drummer for an exquisite evening of imaginative renditions of old favorites. Conducting the performance, and playing vibraphones, will be Kyle Athayde, who also wrote all the arrangements. Intentionally steering away from simply recreating the songbooks of Goodman and Shaw enables the ensemble to engage in longer improvisations, particularly when it comes to shedding spotlight on the strings. In addition to Goodman and Shaw, Will says he and his brother were heavily influenced by musicians like Duke Ellington, who broke barriers by incorporating more modern elements into his music. It’s that element of improvisation and inclusivity of other styles in jazz that the twins find so fascinating. To them, the genre is more about the way a melody is played, than the notes themselves. “The defining quality of jazz is the rhythm, the syncopation,” Will says. Coincidentally, it’s those two notions of performance—the soul versus the intellect—that seemingly shaped the riff between Goodman, known as the “King of Swing,” and Shaw, the “King of Clarinet.” And the Anderson twins’ interpretation of those differing styles is something the duo, along with the entire ensemble, look forward to capturing and communicating to the audience. Catch Benny meets Artie with Strings on Saturday, December 1st at the Oxford Community Center. 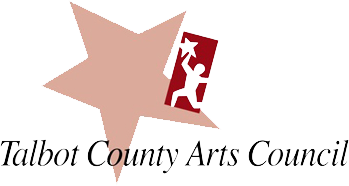 The performance is presented by Chesapeake Music’s Jazz on the Chesapeake in partnership with Oxford Community Center. Tickets are $50. 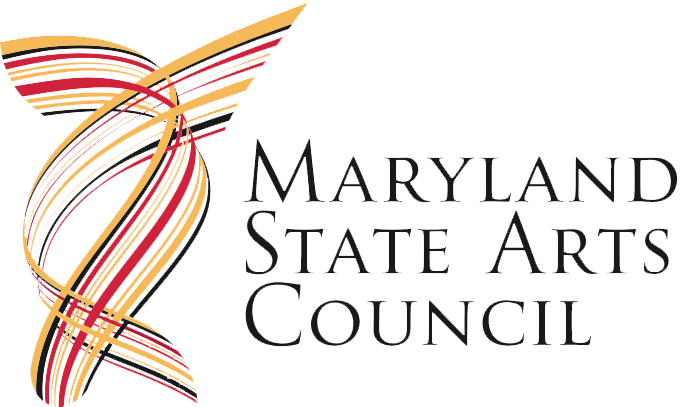 Doors open at 7 p.m.; show at 7:30 p.m. For more information or to purchase tickets, visit Jazzonthechesapeake.com or call 410-819-0380.